This is a 17 inch high bust in a high fired bisque. Hand painted patina. Signed and dated by Artist Robert Toth, for its collectible value. 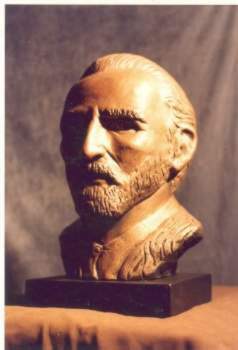 "The best way to know God is to love many things"
The sculptor, Robert R. Toth, uses Vincent van Gogh's self portrait for the likeness as he saw himself. Van Gogh was a Dutch post-impressionist painter. Van Gogh's works are perhaps better known generally than those of any other painter. The great majority were produced in 29 months of frenzied activity interspersed with epiletic seizures and despair that finally ended in suicide. 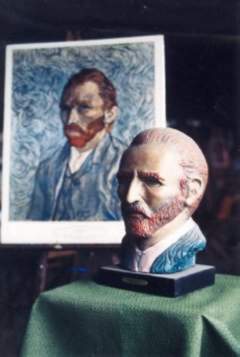 A small Van Gogh bust is also avsilable. A still life painting Tea With van Gogh is also available.